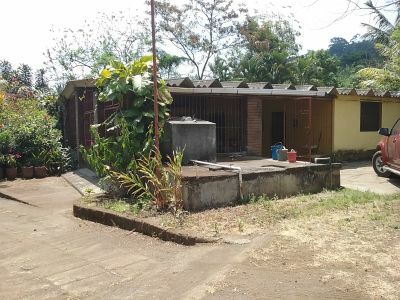 A lovely country house/ farm is for sale 25 minutes from Managua, in San Juan de la Concepcion, La Concha. one kilometer from the entry road, has a partially paved entrance to the property. Has Three independent iron gates. Main house built of quarry stone and concrete. Has 4 large bedrooms, 2 bathrooms, kitchen, dining room and a spacious hall. Separate house for workers with two bedrooms and bathroom. A Storage building. Both the main house and worker's house have running water and working plumbing and bathrooms. 4 cement tanks to store water, electric utilities,drinking water. The property is 20 manzanas all currently growing oranges, avocado, coffee, cocoa, dragonfruit, and precious woods. Beautiful view of the Masaya volcano, cool climate, fertile land good for growing flowers. Nearby community, Spanish language school La Mariposa.